Goal 1: All New Yorkers will have improved access to library resources that advance and enhance their personal, educational, and working lives. Goal 2: The New York State Library, library systems, and libraries will deliver new and improved library programs that anticipate and meet New Yorkers’ constantly changing needs for library services. Goal 4: All New Yorkers will benefit from statewide programs and services of the New York State Library that effectively leverage private and public funding through collaboration and partnerships, and maximize value in order to achieve goals one, two, and three. Analysis of the 2012-2017 Five-Year LSTA Plan activities and target outputs and outcomes showed significant progress in achieving all four goals of the plan, and great statewide impact. The Library Services and Technology Act (LSTA) Program, overseen by the Institute of Museum and Library Services (IMLS), is vital to New York State’s library systems, libraries, and the communities and people they serve. The LSTA funds allocated to the New York State Library for October 1, 2012 to September 30, 2017 were used for two important purposes: (1) supporting multiple statewide services, including those managed by the State Library’s Division of Library Development and Research Library; and (2) providing grants to library systems to improve library services at regional and local levels. Though LSTA funding in New York State represents less than one-percent of total library expenditures, the analysis of 2012-2017 Five-Year LSTA Plan activities and target outputs and outcomes showed significant progress in achieving all four goals of the plan, and great statewide impact. The evaluation period was marked by new and innovative programming, the continuation of essential services, new and enhanced partnerships, and increased access and use. To perform the Five-Year Evaluation, the State Library commissioned an independent, experienced evaluator, Amanda R. Latreille of AmaLat Consulting LLC in mid-2016. The evaluator accessed the State Program Report (SPR), interviewed Division of Library Development and Research Library staff, and reviewed and analyzed all relevant State Library reports, data, and other documentation from 2012 to 2017. Outcome data for some programs was made available and reviewed. 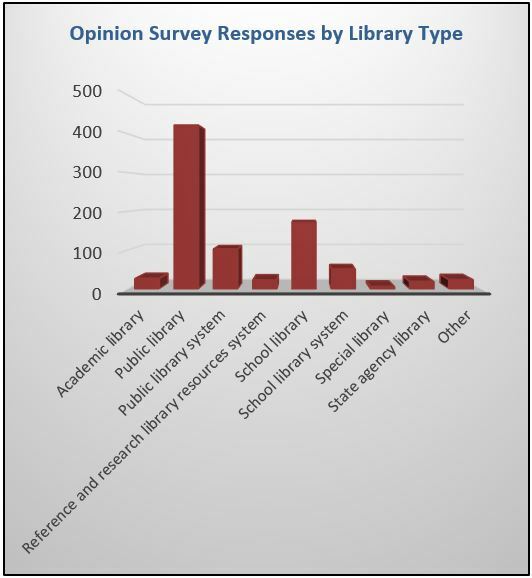 Two surveys were also developed, with input from staff: (1) the State Library Opinion Survey, which collected feedback from the library field regarding the value of State Library services; and (2) the Library System Survey, which collected information about system activities at regional and local levels. The Opinion Survey received 847 responses, and the System Survey received 49 (out of 73 total systems or 67-percent). The Five-Year Plan and its four goals formed the foundation for the evaluation, along with the evaluation instructions provided by IMLS and its Measuring Success focal areas. All six focal areas (Lifelong Learning, Information Access, Institutional Capacity, Economic and Employment Development, Human Services, and Civic Engagement) were addressed, to at least some degree, through the State Library’s work. The Regents Advisory Council (RAC) on Libraries report to the New York State Board of Regents in 2012, titled Creating the Future: A 2020 Vision and Plan for Library Service in New York State, guided the development of the Five-Year Plan and was therefore fundamental to the evaluation as well. This evaluation document will be submitted to IMLS, shared with policymakers and other stakeholders, and posted for public access on the State Library website. Since 2012, the State Library has instituted many new and wide-reaching programs and services. Perhaps the largest and most innovative, Ready to Read at New York Libraries was designed to address early literacy needs, with initial support from a 2014 Laura Bush 21st Century Librarian Program Planning Grant from IMLS. The project provides training and resources to develop lasting, research-based early learning services and re-imagined spaces for families with young children in public libraries. With its focus on community assessment, partnership development, and outreach, the project intends to serve all families, but particularly those with high need and/or those previously unserved. Using a train-the-trainer approach, the program has already established a cohort of youth services librarians as certified trainers/early literacy experts in all regions of the state. While one of the training components is based on the successful Every Child Ready to Read Program (2nd edition) or ECRR2, developed by the Public Library Association (PLA) and Association for Library Services to Children, the program is unique in that it takes several additional steps above and beyond ECRR2 to prepare library staff. As of January 2017, 90 Ready to Read at New York Libraries workshops have been held, with a total attendance of 1,134 (from all 23 public library systems and 406 libraries). 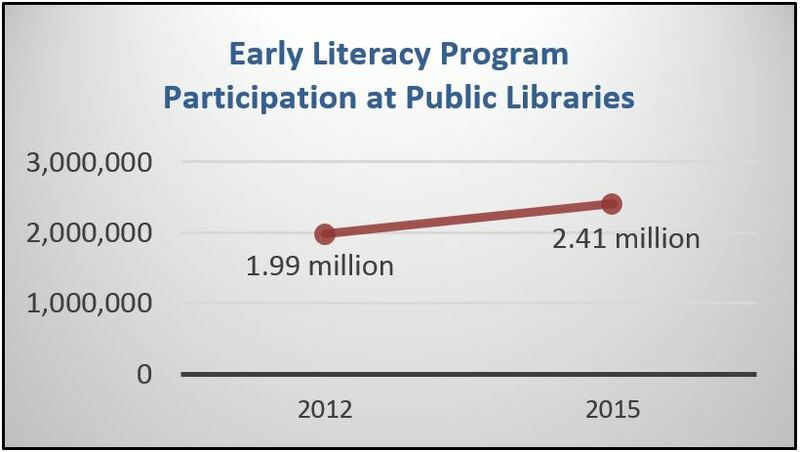 Early literacy program offerings in public libraries grew 13-percent from 2012 to 2015, with attendance up an impressive 22-percent to 2.41 million people (see graph). The trainings will continue into 2019, with support from the 2016-2019 Family Literacy Library Services Program (State Aid). Also important to note, the program has shown that partnership building continues to be key to the success of State Library initiatives, as explored in the previous Five-Year Evaluation. An Advisory Group of early literacy leaders was established early for Ready to Read at New York Libraries, and worked effectively to make connections and further partnerships with more than thirteen organizations, such as the Council on Children and Families and New York State Head Start. Another innovative program, ILEAD USA (ILEAD stands for Innovative Librarians Explore, Apply, and Discover), brought multiple days of leadership and technology training to eight teams of librarians from across the state in 2015. The project was led by the Illinois State Library and funded by IMLS (the State Library and several other state library agencies were sub-grantees). The ILEAD teams each developed projects that aimed to address a specific need and enhance and/or promote library services through the use of technology. All teams successfully presented their project ideas and progress to the larger cohort at program completion. For example, a team of public library system librarians (called HATS or Helping All Trustees Succeed) is developing a trustee education framework online. In fact, support for public library trustees was enhanced in multiple ways. The State Library continued its strong partnership with the Library Trustees Association (LTA) of New York State. The Handbook for Library Trustees of New York State was updated. Many trainings specifically for trustees were offered by the State Library and public library systems (408 trustee trainings for 6,345 participants were offered by systems in 2013-2015). Also, New York Library Trustees Online (NYLTO), developed by library systems in 2012 and partially supported with LSTA grant funds, provides a variety of free resources for library board members. In terms of new support for cultural institutions with collections of rare and archival materials, Documentary Heritage and Preservation Services of New York (DHPSNY) was started in 2016. The five-year project is overseen by the New York State Archives and the State Library with services coordinated by the Conservation Center for Art & Historic Artifacts. The program’s free services include: (1) multiple training opportunities; (2) archival needs assessments; (3) conservation and preservation services; and (4) strategic planning guidance. Three workshops, titled Understanding Archives, and six webinars were held in 2016, with total attendance at 335. Post-workshop survey results indicated the vast majority of participants gained knowledge, felt confident in using what they learned, and plan to apply what they learned. Eighteen institutions were also selected to receive assessment and planning services. Another successful archives and libraries project, New York Capital Region Alliance for Response (NYCRAFR), sponsored by the Foundation of the American Institute for Conservation of Historic and Artistic Works and the National Endowment for the Humanities, brought a disaster planning forum and follow up training and support to collecting institutions in the Capital Region in 2016. LSTA funds supported staff time and expertise for these two new projects. Technology was also a strong focus of the evaluation period. Digital Literacy in New York was a three-year project funded by the Broadband Technology Opportunities Program (BTOP), and managed by the State Library, New York Library Association (NYLA), and New York State Office for Cyber Security. The project used a train-the-trainer approach to prepare library staff in two areas: (1) teaching digital literacy to the adult learner; and (2) using the program’s curriculum in various library situations. From 2012 to 2014, 50 workshops reached more than 1,000 participants from 393 libraries. Many participants reported sharing the curriculum with colleagues and using it in their work (in 2013-2015, 156,405 digital literacy sessions were conducted for 671,963 people). Broadbandexpress@yourlibrary, another BTOP-funded project, was started during the last LSTA cycle and was completed in 2013. The high-impact program developed 30 public computing centers (PCCs) in 30 libraries, and five e-mobile computer training units. The project assisted PCC libraries in extending hours, upgrading broadband connectivity, adding more than 700 new public workstations, and providing access to job-related resources. Sixty-percent of the libraries also increased their broadband speeds. Instruction in digital literacy and job searching and preparation was provided to more than 715,000 people. Also important, the State Aid for Library Construction Program was expanded in 2015 to include funding for broadband installation and infrastructure. State Library-sponsored access to OCLC’s WebJunction was added in 2014. Library staff, trustees, and graduate students in New York State can now freely access WebJunction’s large assortment of online courses and webinars on a variety of library-related topics. These offerings provide professional development hours that can be used towards New York State Public Librarian Certification. Use increased as well (course and webinar participation was 2,688 for July 2014 to June 2015, and up to 3,540 for July 2015 to June 2016). While continued State Library statewide programs and services are many, a few stand out as having extensive impact. Since 1999, NOVELNY has provided free online access to books, journals, magazines, newspapers, encyclopedias, and other commercial database resources. For every one dollar of LSTA funds spent on NOVELNY via statewide database purchasing, an estimated $35 in high-quality information resources is provided. A geolocation feature was added to NOVELNY in 2013, providing quick and easy access based on user geographic location. Content was also expanded, and a greater number of vendor database trainings were offered when compared to the last Five-Year Evaluation (382 sessions total with 3,142 in attendance for FY 2013-2016). To date, 5,900 libraries of all types participate in NOVELNY (up by roughly 300 libraries from 2011), and searches from 2015 to 2016 were 35.3 million. To note, this figure is considerably lower than previous search data (67.5 million in 2012-2013); however, this is in part due to changes in COUNTER reporting in 2014. The vast majority of 2015 searches took place from schools, and most were searches in general periodicals. Summer Reading at New York Libraries is the State Library’s highly successful summer reading program for public libraries. First joined in 2007, the State Library continued its participation in the Collaborative Summer Library Program (CSLP). Roughly 1,100 public library outlets in New York State use the program’s theme and materials. Participation continued to increase greatly, with partnerships and promotion as key contributors to program growth. In 2016, 2.1 million children and teens took part (up from 1.74 million in 2012). See graph at right. This figure exceeded the target of 1.8 million participants by 2017. E-Rate, another important program since 1997, provided approximately $30 million in telecommunications discounts to libraries in New York State from 2013 to 2015. State Library staff continued to provide E-Rate technical assistance throughout the evaluation period. Access to Research Library collections was greatly expanded. The Digitization and Preservation Program digitized 91,291 pages in FY 2013, 8,128 items for FY 2014-2105, and 5,837 pages for FY 2015-2016. The State Library participates in three digital collections initiatives: (1) Empire State Digital Network (ESDN); (2) New York Heritage; and (3) New York State Historic Newspapers. Manuscripts and Special Collections catalogued 1,423 items and developed 152 finding aids for FY 2013-2015. More than 130 presentations and trainings for the general public and staff on a diverse group of topics were also offered in FY 2013-2015. Social media applications (Facebook and a new Instagram account) were used to promote events and collection updates, along with the website and through collaborations with many organizations. Onsite exhibits were displayed monthly or bi-monthly (with an online counterpart), and a traveling exhibit featuring the State Library’s copy of the Emancipation Proclamation took place in late 2012. The number of individuals with borrower cards of all types remained constant (21,368 in FY 2015), even as expired accounts were removed. New York State Resident Borrower Card figures grew steadily (up five-percent to 7,656 for FY 2015). However, reference consultations and circulation for individuals have decreased significantly from FY 2013 to FY 2015 (by 14-percent and 34-percent respectively). Interlibrary loan (ILL) use statistics also decreased. Total ILL requests filled were 45,100 in 2012-2013, and 16,153 in 2015-2016. The drop in ILL resulted from the transfer of Prisoner Services Project activities out of the State Library. The State Library provided the following three LSTA sub-grant programs to library systems from 2012 to 2013: (1) Digitization Projects; (2) Service Improvement Grants; and (3) Summer Reading Mini Grants. 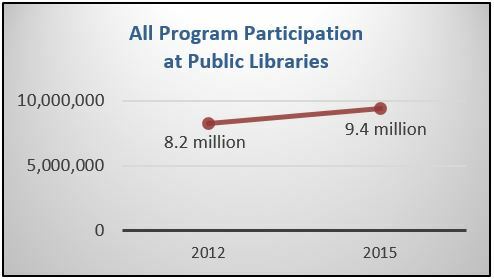 In FY 2013, the State Library’s longstanding policy of awarding sub-grants to library systems was eliminated due to cuts totaling roughly $1.6 million in LSTA monies from 2010 to 2013 (see graph). The State Library’s LSTA expenditure policy now stipulates that federal funds are to be used for statewide programs that impact large numbers of libraries and library users. The greatest challenges faced by the State Library in carrying out activities outlined in the Five-Year Plan were federal and state funding cuts that occurred in the final years of the Great Recession. As mentioned above, LSTA monies received by New York were reduced considerably. State Aid was also cut to an 18-year low in 2011-2012 ($79 million). These funds have slowly rebounded to $95.6 million in 2016-2017, yet State Aid for Libraries continues to be underfunded per Education Law (to note, these figures do not include capital funds for the State Aid for Library Construction Program). Cuts, however, go back further as illustrated with funding used for State Library operations, which includes federal and state support. State Library income for 2006-2007 was $19 million, and in 2015-2016, it was $12 million (a 37-percent decrease). These cuts led to the cessation of the sub-grants to library systems program, and advanced already well-established staffing shortages in both the Division of Library Development and the Research Library. With fewer staff resources, not all Five-Year Plan activities were completed (target outputs and outcomes both achieved and not achieved are noted throughout this report). The State Library’s total staff in FTEs was 176 in 2006, and in 2016, it was 102.9 (down a massive 42-percent). Respondents of the System Survey echoed these same challenges of funding and staffing shortages. Another significant challenge is funding for NOVELNY. After almost two decades, the commercial database collection continues to be supported with LSTA funds. Many other state library agencies are funding database purchasing with state funds, freeing up LSTA monies for new programming and sub-grants. Legislation to fund NOVELNY at the state level has been put forth by members of the New York State Legislature multiple times over the years, but it has not yet been approved due to lack of support. Website data collection was also an issue. In 2013, the New York State Education Department (NYSED) began updating its web content management system to Drupal (the State Library webpages are housed within the greater NYSED website). The new system does not yet track web visits, so the use of many State Library webpages and online tools is currently unknown. Continue the new, high-impact programs started during the evaluation period, including Ready to Read at New York Libraries and DHPSNY. Both are well-underway and achieving desired results. Continue key essential programs and services, such as NOVELNY and Summer Reading at New York Libraries. The Opinion Survey indicated that these programs were highly valued by the library field. Monitor use data for programs and services, and evaluate further as needed. Work with NYSED to institute tools for measuring the use of State Library webpages, as collection methods are not currently in place. Communicate the value of library services and the importance of LSTA funds and State Aid with policymakers, other stakeholders, and the general public. Explain the need to secure state funding for NOVELNY. Continue to work closely with organizations that further this message and advocate for New York’s libraries, such as NYLA and LTA. Question A-1: To what extent did your Five-Year Plan activities make progress towards each goal? Where progress was not achieved as anticipated, discuss what factors (e.g., staffing, budget, over-ambitious goals, partners) contributed? Activity 1/Targets: Develop opportunities and partnerships among libraries, library systems, state government, private industry, the nonprofit sector, and others to expand statewide access to e-resources for all New Yorkers. First developed in 1999, NOVELNY (previously known as NOVEL and Empire Link) provides New Yorkers with free access to an electronic collection of books, journals, magazines, newspapers, encyclopedias, and other commercial database resources through local libraries and remote locations such as home, school, or office. During the evaluation period, the State Library continued to maintain the NOVELNY website/portal. Due to the change to Drupal (open source website design software) in 2013, website use data was not available (attempts to use Google Analytics as an alternative provided intermittent and varied types of data, so these statistics were not used). The NOVELNY Facebook page, however, indicated 809 likes and 780 followers in January 2017(up from 530 likes in 2011). The NOVELNY Help Desk continued to be a service available to libraries, with library registrations and questions taken via phone and email. From 2013 to 2015, there were 1,438 requests/transactions. The number of libraries participating in NOVELNY also increased. Close to 5,600 libraries participated in 2011. Presently, 5,900 libraries participate in NOVELNY (up by roughly 300 libraries). NOVELNY access was expanded with the addition of geolocation in July 2013 (see more information on page 3). The State Library continued its partnership with the New York State Department of Motor Vehicles (NYS DMV), including promotional NOVELNY materials in vehicle registration and driver license renewals (as access can be obtained via driver license or non-driver identification number). NOVELNY bookmarks for libraries to download and customize were made available via the website in 2016. These bookmarks were also distributed to the public at the New York State Fair in 2016. As for use, data provided by e-resource vendors indicates NOVELNY searches decreased significantly from 67,513,301 (July 2012 to June 2013) to 35,325,611 (July 2015 to June 2016). The figures, however, cannot be accurately compared, as there was a change in COUNTER reporting in 2014. Prior to the change, retrievals included those from federated search engines, and this is no longer the case (retrievals are only counted if the user clicks on the item to view). Searches within discovery services will not produce retrievals or searches unless the user clicks on the native vendor interface to view the article or to perform a new search. Also, other changes decreased use statistics to a lesser degree, such as browsable databases, improved search algorithms, and better result relevancy ranking. 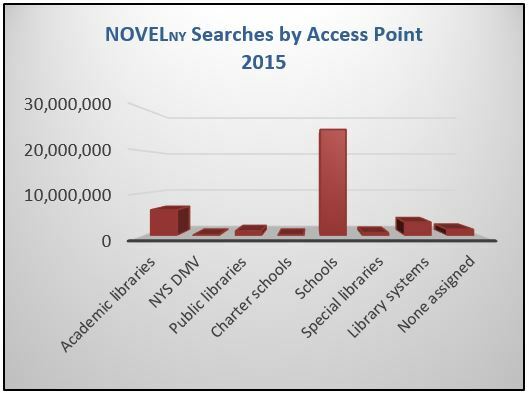 To provide a snapshot of NOVELNY use, search statistics by access point and subject for 2015 are depicted in the following graphs. Schools were the greatest users, and more than half of searches involved general periodicals. One System Survey respondent (a school library system director) wrote: The continuation of NOVELNY is vital to the work in our schools. Many of our schools would be left with no databases without it (see Appendix). Because of the collaborative, cooperative, and cost-effective services provided by New York State’s 23 public library systems, e-books are currently available to New Yorkers through 98-percent of New York’s 756 public libraries, which have some 1000 outlets. According to the State Library’s recent survey of public library systems, over $11.5 million was spent on e-books last year, over $7.5 million by library systems (including the three New York City public library systems) and over $4 million by local libraries. This investment purchased or licensed over 1.5 million e-books. Even so, over 70-percent of the library systems that responded to the survey indicated that availability does not meet demand, and demand is only expected to increase in the future. Some library systems report annual increases of 30-percent in e-book circulations. Strive for equity of access to e-books and other e-content for New Yorkers of all ages, ensuring that all libraries in New York State have the resources and support necessary to subscribe to or purchase e-books and to provide the technology necessary to read them. Explore and invest in new technologies that may provide (a) more streamlined access to e-books, (b) access to enhanced free collections, (c) alternatives to existing e-platforms, and (d) sharing of e-book collections. Address the increasingly high demand for e-books by exploring possibilities for establishing cost-saving mechanisms at the State level. By 2020, provide all New Yorkers with free access to a minimum broadband speed of 100 Mbps at their local public library or neighborhood branch. Also to note, the Opinion Survey (see Appendix) found that NOVELNY was ranked very important by 51-percent of respondents. Only two other statewide programs/services received higher very important scores (broadband initiatives with 56-percent, and Summer Reading at New York Libraries with 58-percent). The NOVELNY website also received the third highest very important score among the State Library’s eighteen technology products (at 39-percent), and ranked number one among all technology products by 22-percent of respondents. The survey also inquired about desired State Library programs and services that are not currently offered. Slightly more than half of respondents felt centralized e-book purchasing (52-percent) and a statewide e-book platform (57-percent) should be provided. Data is not available for the target, by 2017, 80-percent of New Yorkers replying to a survey will report benefiting from use of an e-resource through a library. A user survey was not conducted during the evaluation period. Activity 2/Targets: Achieve a model of consortial licensing of commercial e-resources with shared cost or tiered pricing among New York State Library, State University of New York (SUNY), City University of New York (CUNY), library systems, state agencies, and other partners such as NYLA and NYSHEI. A statewide model of consortial licensing of commercial e-resources was not developed. Since 2011, the New York State Comprehensive Information System (NYSCIS) bill has been introduced in multiple State legislative sessions, but has not passed due to a lack of support. NYSCIS would authorize the State Library to coordinate the bulk purchase of electronic resources like databases for state agencies, libraries, and other governmental entities that would save the state and local government’s money. Two of the three library system groups, however, have instituted consortial licensing projects. The Empire State Library Network, made up of the nine reference and research library resources systems, developed the Demand Driven E-book Pilot in 2012. The School Library System Association of New York State also continued the School Library System Consortium of Online Resources for Education (SCORE) . Originally developed from a smaller, grant-funded project in 1998, SCORE has grown to offer coordinated consortial purchasing of online and e-book resources for K-12 students in the 700 plus public school districts and over 500 non-public schools in New York State. Activity 3/Targets: Expand the core collection of commercial e-resources available statewide to include additional library materials for academic research, small business, K-12 education, workforce development, and lifelong learning. The State Library updated NOVELNY’s database collection. For 2017-2018 (paid with 2016-2017 LSTA funds), NOVELNY will include: (1) Academic OneFile with InfoTrac Collections; (2) Business Insights: Essentials; (3) Computer Database; (4) Educators Reference Complete; (5) Encyclopedia Britannica; (6) Expanded Academic ASAP; (7) General OneFile with InfoTrac Collections; (8) General Reference Center Gold; (9) Health Reference Center Academic; (10) Informe Académico; (11) InfoTrac Newsstand (includes New York State Newspapers); (12) Kids InfoBits; (13) Opposing Viewpoints in Context; and (14) Research in Context. Since the last evaluation, four new databases were added/purchased (Kids InfoBits, Opposing Viewpoints in Context, Encyclopedia Britannica, and Research in Context), and five were either discontinued or added and then discontinued. The State Library also periodically assessed database needs. 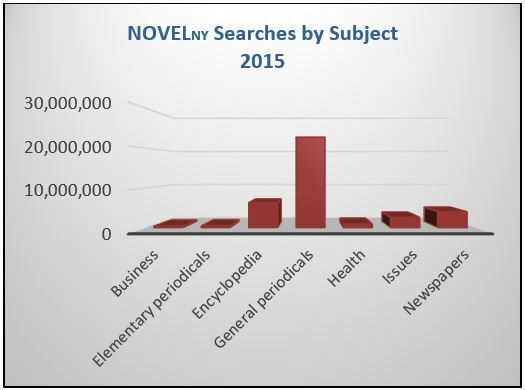 In 2012 and 2015, online NOVELNY Database Surveys were administered to help determine which commercial e-resources were the most valuable to users. More than 1,400 responses were received in both 2012 and 2015, with summarized results at http://www.novelnewyork.org/surveyresults.php and http://www.novelnewyork.org/survey2015results.php. Additionally, an interactive NOVELNY program was offered at the NYLA Conference in 2015, asking for input from the library field. Twenty-five people from all types of libraries attended the forum. See http://www.novelnewyork.org/forum2015.php for results. Activity 4/Targets: Partner with vendors, library organizations, and others to explore technology solutions such as geolocation to streamline and enhance remote access to commercial e-resources for all New Yorkers. In July 2013, the State Library worked with Gale to add geolocation to many of the NOVELNY databases. Geolocation is a method used to permit access to a database based on user geographic location, as determined by IP address. Since implemented, New Yorkers have been able to access databases through their local library’s website or via the NOVELNY portal while in the state, without having to enter a username/password, library card number, or driver license number. Vendor data indicates that geolocation access steadily increased (486,225 sessions in 2016), and that schools were also the largest geolocation market. Activity 5/Targets: Participate in regional, state, and national initiatives to expand public access through libraries to the digital holdings of New York libraries and other cultural institutions. ESDN, a service hub of the Digital Public Library of America (DPLA) , shares New York’s rich digital cultural heritage with the DPLA. The Network is administered by the Metropolitan New York Library Council in collaboration with eight allied regional library councils collectively working as the ESDN. Together, they provide the necessary personnel and technological infrastructure to contribute digital resources from hundreds of New York’s libraries, archives, museums, and cultural heritage institutions to the DPLA (from http://empirestate.digital). As a result of ESDN, more than 65,000 items in the State Library’s Digital Collections can be found through DPLA. State Library staff also enriched 156,379 metadata records. New York Heritage is a research portal for students, educators, historians, genealogists, and anyone else interested in the Empire State’s history. The site brings together open access digital collections from libraries, museums and archives from all over the state. It provides a gateway to more than 160 distinct digital collections that reflect New York State’s long history. The collections represent a broad range of historical, scholarly, and cultural materials held in libraries, museums, and archives throughout the state. Collection items include photographs, letters, diaries, directories, maps, newspapers, books, and more (from https://www.esln.org/services/new-york-heritage). New York State Historic Newspapers provides free online access to a wide range of newspapers chosen to reflect New York’s unique history. The project uses the CHRONAM software platform developed by the Library of Congress Newspaper Project to provide immediate free access to millions of newspaper pages published in New York State. Researchers may search by city, county, date, title, and full text keywords. Digitization efforts included digitizing items from the State Library’s print collections of historic and contemporary New York State Documents. During the evaluation period, State Library staff focused on providing digital access to items unique to the state, such as laws, legislative hearings, and government reports. To note, the State Library’s Digitization and Preservation Program digitized 91,291 pages in FY 2013, 8,128 items for FY 2014-2015, and 5,837 pages for FY 2015-2016. Also, as mentioned under the next Five-Year Plan goal on page 7, the State Library was a sub-grantee of ILEAD in 2015. One ILEAD team of State Library staff members carried out the successful project, History’s Minions. The project explored the use of social media tools, such as crowdsourced transcriptions and podcasting, to highlight special collections documents. The team’s work resulted in transcriptions and a professionally produced podcast of the Letters of Rufus McIntire (McIntire was a United States Army Captain during the War of 1812). Activity 6/Targets: Partner with vendors and others to provide training for library staff and patrons in accessing and using e-resources. State Library-sponsored training in how to use NOVELNY databases was offered by vendors throughout the evaluation period. FY 2013-2016 training opportunities (382 total sessions) and participation (3,142) greatly exceeded the training offered during the previous evaluation period. However, it is not known if the Five-Year Plan target of 5,000 trainees was met (as this was to include library system training, and the Annual Report does not separate out NOVELNY training from technology training). 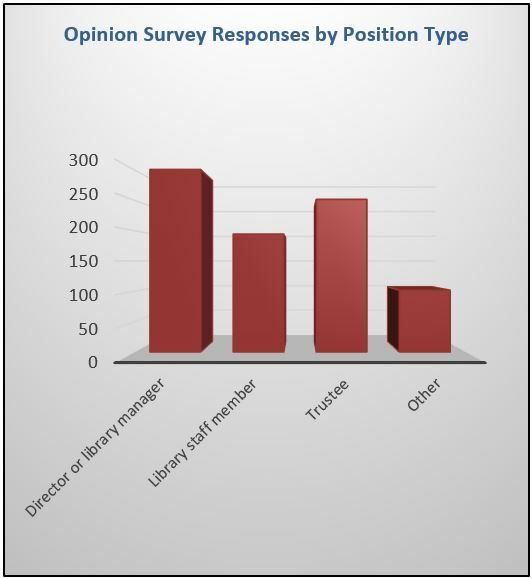 For FY 2015, the State Library began to measure training outcomes using LSTA survey questions. Of the 121 survey responses received for webinars, the vast majority (96-percent) indicated they agreed or strongly agreed with the statement: I learned something by participating in this library activity. Ninety-percent also agreed or strongly agreed with this statement: I am likely to apply what I have learned. Activity 7/Targets: Strengthen partnerships among the State Library, library systems, and others to improve the delivery of library materials statewide. The State Library continued its membership in the Information Delivery Services (IDS) Project. See more information on page 21. No new partnerships related to delivery were established during the evaluation period. Activity 8/Targets: Leverage federal E-Rate telecommunications discounts to improve and sustain high-speed broadband connections at libraries and enhance public access computing services for all New Yorkers. Started in 1998, the E-Rate Program provides libraries in New York State with telecommunication discounts, improving user access to electronic information through faster and more reliable connections. The State Library continued to provide libraries and library systems with technical assistance, via a designated E-Rate Program Coordinator and a regularly updated webpage. NYSED has also maintained a contract with E-Rate Central to provide expert help with filing, as well as weekly e-newsletters, webinars, and other online resources. The annual E-Rate discount total has remained fairly consistent, with $9,976,279 in discounts collected in 2012, $9,422,650 in 2013, $9,537,097 in 2014, and $10,300,896 in 2015. In 2015, 308 libraries and 32 library systems in New York participated in the E-Rate Program (as of November 2016). During the previous evaluation period (2007-2011), the average annual discount total was $10,145,504. Also to note, in 2014 two modernization orders significantly changed the E-Rate Program, and in 2015 for FY 2016, the application process was completely reconfigured at the federal level. Eligible services were changed, including the phasing out of voice services. Also, now all applications and any communication must be submitted through the new online E-Rate portal. In its first year, there were several issues reported including: (1) the portal did not work properly at times; (2) aspects of the portal changed mid-year; (3) new categories were not applicable; (4) importing previous years’ data was difficult; and (5) supporting databases were incomplete. Therefore, there may be fewer applicants (complete 2016 data is not yet available). Data for the Five-Year Plan target, by 2016, 20% of libraries receiving E-Rate discounts enable them to offer services valued by their users, was not collected during the evaluation period. In addition, in 2013, NYSED and the State Library participated in shaping the new E-Rate Program by replying to the Federal Communications Commission’s proposed modernization . Activity 9/Targets: Partner with national, state, and other government agencies and organizations in cooperative efforts to ensure that every library in New York State obtains and sustains robust high-speed broadband connections and Internet access. From February 2010 to January 2013, the State Library received $9,521,150 in federal stimulus funds (with matching monies at $5.4 million) from the National Telecommunications and Information Administration and BTOP to carry out Broadbandexpress@yourlibrary. The successful project developed PCCs in 30 libraries, and five e-mobile computer training units. It enabled public libraries to extend hours, upgrade connectivity, add more than 700 new public workstations, and provide 24/7 access to job-related e-resources in 41 counties in Upstate New York. LSTA funds were used to partially support State Library staff time in coordinating the project. The project had great impact. It was developed with OBE (and OBE basics were taught to PCC and e-mobile staff via an OBE and Sustainability Workshop in 2011). Sixty-percent of PCC libraries increased their broadband speeds, with 75-percent at more than 10 Mbps. Instruction in digital literacy and job searching and preparation (770,771 hours) was provided to more than 715,000 people. The e-mobiles traveled in excess of 2,500 miles per week to a total of 14 rural counties. The libraries also partnered with a variety of organizations, including local colleges, Boards of Cooperative Educational Services (BOCES), non-profit organizations, the New York State Department of Labor, and the Office of the Aging. More than 585 people served by the project reported back to library staff that they had found employment. All of the PCCs and e-mobiles found the means to sustain some or all of their services beyond the 2011-2013 grant period. The State Library developed a Broadbandexpress@yourlibrary webpage with access to a final report including more about the project and each of the PCCs and e-mobile units, output and outcome data, lessons learned, and future broadband needs and work to be done. The E-Rate Program, described earlier, also supported the delivery of high-speed broadband in libraries. State Aid for Library Construction provided funding for construction, expansion, and renovation of public library buildings, and as of 2015, this funding can now be used for broadband installation and infrastructure. Activity 10/Targets: Develop opportunities for more libraries to offer virtual meetings, distance education, and other technology-based applications for the public. Broadbandexpress@yourlibrary provided funds to participating libraries for the purchase of virtual meeting and distance education technologies and equipment. LSTA Service Improvement Grants (2012-2013) also supported multiple technology-related projects. Data from the Annual Reports indicates that the number of public libraries in New York State with videoconferencing available for public use increased. In 2012, 136 library outlets offered videoconferencing, and in 2015, 187 outlets offered this service (or 17percent). The achievement of the Five-Year Plan target of 20-percent of library outlets offering this service by 2017 cannot yet be determined, as the most recent Annual Report data available is for 2015. Results from the Opinion Survey showed that 51 percent of respondents answered yes when asked if the State Library should offer support for videoconferencing. Activity 11/Targets: Partner with library systems and others to ensure that all New Yorkers have access to a local public library. The State Library’s work in establishing public library districts continued. The Public Library Districts webpage was maintained, with a How-To Guide. From 2012 to 2016, 12 public library districts were created (the target was 15). Also from July 2012 to July 2016, the number of formerly unserved New Yorkers who now have a local library grew by 22,567 (the number of people considered unserved or living outside public library service areas in July 2016 was 1,012,977). Though some progress was made, this number is significantly lower than the initial target of an additional 100,000 formerly unserved New Yorkers by 2017 (only 23 percent was attained). This was due in part to a lack of State Library staffing and other resources to promote and support the voluntary formation of public library districts and to encourage local libraries to expand the boundaries of their chartered service areas to encompass unserved areas (these activities require extensive staff time and expertise). The State Library is committed to working with partners to reenergize this priority Regents policy initiative over the next few years. The Governor’s 2014 and 2015 vetoes of special district legislation for two libraries appears to have temporarily dampened local interest in trying to form special legislative district libraries despite the fact that a special district library may be the only viable option for some localities in regards to mergers, consolidation, or other actions needed to improve the delivery of library services. Seventy-five percent of the new public library districts formed during the evaluation period were school district public libraries. Activity 1/Targets: Strengthen partnerships among the State Library, library systems, and others to educate library staff, library trustees, and others about innovative models of public library governance, program delivery, and support. In 2015, the State Library became a sub-grantee of an IMLS-funded project led by the Illinois State Library called ILEAD USA. Multiple state library agencies participated in the leadership and technology immersion program for librarians. Through three multi-day, face-to-face trainings, virtual meetings, and mentoring over the course of nine months, ILEAD in New York fostered the development of eight librarian teams and their projects. Though each was very different, all of the projects aimed to address a specific need and enhance and/or promote library services through the use of technology. At completion, all eight teams successfully presented their projects to the full New York cohort. Along the way, the teams also created Pecha Kuchas and Seed and Grow Videos that were uploaded to YouTube (see the ILEAD channel ). One of the ILEAD projects, titled HATS, was the creation of a trustee education framework made up of five modules: (1) Orientation (the basics); (2) Legal Issues for Libraries; (3) Financial and Fiduciary Responsibilities; (4) Planning and Advocacy for Library Sustainability; and (5) Seven Habits of Highly Effective Boards. Team members are librarians from multiple public library systems. The project, nearly fully developed, was featured in the LTA newsletter, and presented at the organization’s institute in May 2016 and to other library groups. The Handbook for Library Trustees of New York State was also updated in 2015 and then revised in 2016, with assistance from the State Library, Public Library System Directors Organization of New York State, LTA, and NYLA. The HATS team was also involved, with the team mentor co-authoring the handbook. It was featured in Library Journal’s Library Hotline, and it can be viewed at the link above. An overview webinar was sponsored by the State Library in June 2016, and HATS webinars are also planned for the near future. The State Library also continued to work closely with LTA, attending all board meetings, contributing to each issue of the quarterly newsletter that reaches some 6,000 trustees, and exhibiting and often presenting at its annual statewide conference. The State Librarian spoke at the 2016 Trustee Institute. The State Library and LTA co-sponsored nine webinars from 2013 to 2016, with 892 total participants. Example webinar topics included What Every Trustee Should Know and Critical Partnerships: Public Library Trustees and Directors. WebJunction, discussed on page 19, also serves as a State Library-sponsored education resource, including relevant courses and webinars designed for staff and trustees such as Community Engagement and The Rural Library Trustee: Roles, Responsibilities, and Relationships. NYLTO was started in 2012 with support in part from an LSTA grant awarded to nine public library systems. Now with all 23 public library systems participating, NYLTO provides a variety of free trustee resources. Also significant, Annual Report data indicated public library systems offered 408 trustee trainings for 6,345 participants from 2013 to 2015. In terms of State Library staff training, Division of Library Development librarians participated in a wide variety of training, and exceeded the Five-Year Plan target of 75-percent of librarians completing at least 12 hours of work-related training annually (84-percent annual average). Stringent State restrictions on staff travel continued to exist; therefore, webinars from IMLS, the Chief Officers of State Library Agencies (COSLA), WebJunction, PLA, NYLA, and others provided essential training opportunities for staff. Topics included assessment, collections, leadership, new technologies, outreach, reporting, preservation, and youth services. Data regarding Research Library staff participation in professional development was unavailable. Activity 2/Targets: Support, encourage, and expand innovative library programs, improved services, and effective evaluation processes in libraries and library systems by providing a range of advisory services to help library staff use performance (outputs) and results (outcomes) in measuring progress toward excellence and community impact. Established in 2003, the State Library continued its OBE Initiative. This project aims to provide training and resources to assist library staff in determining the impact and benefits of library services on users and communities. The OBE Initiative website, with basic and advanced OBE resources and information about trainings and State Library-certified trainers. Two successful OBE Workshops, open to all types of librarians statewide, were held at the Mid York Library System in 2014 and 2016, with 27 total attendees. The comprehensive trainings, each two full days, covered developing complete logic models, writing meaningful and measurable outcomes, and creating effective surveys and other data collection tools. The most recent training also included a module on PLA’s Project Outcome (to note, the Opinion Survey indicated 29 percent of respondents said yes when asked if they would like statewide support for Project Outcome). Training surveys in 2016 indicated that 100-percent of attendees reported increased knowledge of OBE post-workshop (100-percent rated themselves at average or higher knowledge post-workshop). The evaluations also showed that 100-percent of attendees felt they had increased ability to use OBE post-workshop (100 percent rated themselves at average or higher ability post-workshop). OBE training for library staff was included in two other State Library initiatives, Broadbandexpress@yourlibrary and ILEAD. During the evaluation period, the State Library also continued to incorporate OBE into the planning and evaluation of LSTA activities and many of its programs, including (1) Broadbandexpress@yourlibrary; (2) DHPSNY; (3) Library System Plans of Service; (4)Ready to Read at New York Libraries; and (5)Summer Reading at New York Libraries. Activity 3/Targets: Enhance national, state, and regional communications about the innovative and exemplary library programs and best practices of New York’s libraries and library systems. RAC sessions, titled 2020 Vision and Plan Smackdown Programs, at the NYLA Conferences in 2014, 2015, and 2016 featured outstanding library programming across New York State. For example, the 2016 theme was New York’s Libraries are Innovation! More than sixty people attended. RAC presented new and innovative library programs to the Board of Regents in 2013, 2015, and 2016. State library staff conducted presentations for the Board of Regents’ Cultural Education Committee regularly, and in June 2016, Summer Reading at New York Libraries was presented to the full Board. State Library staff regularly shared innovative library programs with other states through COSLA and the Council of State Library Agencies in the Northeast (COSLINE). Broadbandexpress@yourlibrary materials, including the final report, were widely shared and popular with other state library agencies. The report won a NYLA/Government Information Round Table Notable Document Award in 2013 which increased its visibility. A Best Practices: Workforce Development in Your Library webinar was also offered as part of Broadbandexpress@yourlibrary. The innovative projects developed by ILEAD teams were shared with other states and IMLS. Ready to Read at New York Librariesshared best practices in providing early literacy services. The State Library partnered each year with the New York State Legislature to bring press attention to the State Aid for Library Construction Program and the many projects it has funded, as well as Summer Reading at New York Libraries. Activity 4/Targets: Strengthen partnerships among the State Library, library systems, libraries, IMLS, and others to provide user-friendly, timely, and accurate data via the Internet for the ongoing evaluation and continuous improvement of library services and programs. The State Library continued to use Bibliostat Collect and Connect, online software products developed by Baker and Taylor for the data collection and data sharing and comparison needs of New York State library systems and libraries. Freely available to the public, Connect provides library data back to 1991 from the Annual Report for Public and Association Libraries and the latest data from the Public Libraries Survey, the Public Library Data Service, and the LJ Index of Public Library Service for all public libraries in the country. Bibliostat CollectConnect is an upgraded, all-in-one product that the State Library has begun to use (the Connect portion), with plans to move completely to the new platform in the future. The State Library, working with Baker and Taylor, made regular improvements to Bibliostat Collect due to new information required by IMLS, changes in State laws and regulations, and changes in the way library services are delivered. Improvements were also made based on feedback submitted annually from local library staff. Two major rounds of upgrades, in an effort to streamline reporting and increase accountability, were completed in 2013 and 2016. The response from users was positive. Activity 5/Targets: Strengthen partnerships among the State Library, NYSED’s Office of P-12, school library systems, and others to improve, enhance, and sustain programs and services of New York’s school libraries. The State Library continued its strong partnerships with NYSED’s Office of P-12, other state agencies, NYLA and its Section of School Librarians, and the School Library Systems Association (SLSA) of New York State to further school library programming and services. For example, State Library staff worked with the Office of P-12 on the development and revision of the School Library Media Program Evaluation Rubric. In 2014, a School Library Summit was held by NYSED and NYLA, and the State Library worked collaboratively with these groups on the follow up activities identified. The State Library and SLSA also heavily participated in NYSED’s Uncommon Approaches to the Common Core Conferences, and joint work led to the addition of the Empire State Information Fluency Continuum to EngageNY . State Library staff participated in continuum evaluation, revision, training, and promotional activities. Activity 6/Targets: Strengthen partnerships among the State Library, NYSED’s Office of Higher Education, reference and research library resources systems, and academic and special libraries (both statewide and nationally), and others to improve, enhance, and sustain programs and services of New York’s academic and special libraries. LSTA funds were used to provide 2012-2013 digitization sub-grants to most of the reference and research library resources systems (see project descriptions). The State Library continued to oversee multiple State Aid programs that directly benefit these systems, their members, and users, including the Conservation/Preservation Program, Coordinated Collection Development for Academic Libraries Program, Hospital Library Services Program, the Medical Information Services Program, and the Regional Bibliographic Databases and Interlibrary Resources Sharing Program. The State Library also worked with several national partners on the Alliance for Response project, and staff served on the program’s Steering Committee with members from the State Archives, SUNY Albany, other area colleges and universities, local historical organizations, and government agencies. The State Library continued its membership in the IDS Project, a collaborative resource-sharing program made up of primarily academic libraries. State Library staff also held monthly conference calls with the directors of the reference and research library resources systems and participated in I2NY committees. Activity 7/Targets: Strengthen partnerships among the State Library, NYSED’s Office of Adult Career and Continuing Education Services (ACCES), public library systems and public libraries, and others to improve, enhance and sustain workforce development, lifelong learning, and literacy programs and services of New York’s public libraries. The State Library’s Adult Literacy Library Services Program provided two rounds of State Aid funding to all 23 public library systems (one for 2013-2016 and one for 2016-2019). Both funding cycles shared the following theme: Workforce Development at New York Libraries through Public Library Systems. The projects included programs for adults 16 or older who are unemployed or underemployed; unfamiliar with technology; have low job skills and/or low literacy skills with the opportunity to develop strong workforce, literacy, and/or digital literacy skills. Program participants prepare for high school equivalency tests such as TASC (Test Assessing Secondary Completion); acquire citizenship information and improve English language skills. Training and resources are offered by library systems and libraries working in partnership with a wide variety of education, workforce, literacy, and other community-based and government organizations (from the 2016-2019 Adult Literacy Projects web page). The Coordinated Outreach Services Program also provided State Aid to each public library system annually to assist vulnerable and high-need populations, including those adults 16 and older described above. State Library staff took part in the Statewide Outreach Services Meeting conducted each year, offered orientations for new Public Library System Outreach Coordinators, and also participated in Outreach Coordinator conference calls. Library State Aid also continued to include funding for State Correctional Facilities and County Jails that is used, at least in part, to support workforce development in incarcerated populations. Information from NYSED’s ACCES, such as TASC updates, were shared regularly with the library field. The State Librarian and key State Library staff also met with ACCES to discuss the Workforce Innovation and Opportunity Act and libraries multiple times in 2014 and 2015. Broadbandexpress@yourlibrary provided extensive workforce development services as well. Activity 8/Targets: Expand and sustain conservation/preservation program activities in New York’s libraries, including technological solutions. During the evaluation period, two new programs were developed under the umbrella of the New York State Program for the Conservation and Preservation of Library Research Materials: (1) DHPSNY; and (2) the NYCRAFR (detailed under the next activity). Started in 2016, DHPSNY is a new collaboration between the State Archives Documentary Heritage Program and the State Library Conservation/Preservation Program. The project, to be carried out over five years through a contract with the Conservation Center for Art & Historic Artifacts, was developed to support the vast network of non-government, unique library, and archival repositories that hold and oversee New York’s historical records. The free services offered include: (1) training via in-person workshops and webinars; (2) archival needs assessments; (3) conservation and preservation services; and (4) strategic planning guidance. Recipients of assessment and planning services are selected via a competitive review process led by the Advisory Committee of archives, library, and conservation professionals. In October 2016, the first round of recipients were chosen (18 institutions selected out of the 29 institutions that applied). I learned something by participating in this workshop. I am confident about using what I have learned. I am likely to apply what I have learned. Applying what I have learned will help improve my collecting institution’s services to the public. As of December 2016, three full-day DHPSNY workshops, titled Understanding Archives, were held in Buffalo, Glens Falls, and Highland, New York, with 97 people in attendance. Outcome data was collected via post-workshop surveys, with a 78-percent response rate. As noted in the previous chart, the workshops were very effective, with the vast majority reporting that they gained knowledge, felt confident, and plan to apply what they learned. In addition, six DHPSNY webinars were held in 2016, with 238 participants. Topics included an introduction to DHPSNY, fundraising, agents of deterioration, and digitization. For more information, visit the DHPSNY website . Here, information about the program, trainings, and application processes and deadlines is posted. Future plans for the website include adding an online directory of repositories across New York State, and message boards. The program will also include a mentorship component (currently in development), and the creation of a statewide documentation plan to assist institutions in identifying and making available historical records of under-documented groups and topics. Activity 9/Targets: Strengthen partnerships with federal, state, and regional organizations to assist libraries in developing continuity of services and disaster recovery strategy plans. In 2016, the State Library and the State Archives coordinated NYCRAFR, a program in the Capital Region sponsored by the Foundation of the American Institute for Conservation of Historic and Artistic Works and the National Endowment for the Humanities. The project included two main activities: (1) a kick-off forum that brought together cultural heritage and emergency management professionals that fostered collaboration; and (2) a two-part workshop, titled Building Your Institution’s Disaster Preparedness Plan, designed with feedback from the forum. Sixty-five people attended the forum, which was well-received and effective per evaluations, and 22 organizations (each sending two to three people) attended the workshop. Twenty post-workshop surveys were received with results showing increased staff knowledge of disaster preparedness, and increased institutional disaster readiness. Twenty of the 22 participating organizations (or 91 percent) submitted disaster recovery plans to the project consultant, who reported the plans were well designed. The State Library plans to expand this successful program to other regions, if additional grant funding can be obtained. Also to note, public libraries with disaster recovery plans per Annual Reports were 503 in 2012 and 559 in 2015 (up to 74 percent of all public libraries, greatly exceeding the Five-Year Plan target of 60 percent). Data for the target regarding participants contributing to a dark archive for audio digitization projects was not available. Activity 1/Targets: Partner with public library systems and other organizations to periodically assess public library needs for building construction, expansion, and renovation. The State Library, in partnership with public library systems, has continued to assess public library construction, expansion, and renovation needs, as was done during the last evaluation period (and first begun in 2001). Aging and energy inefficient buildings, greater technology demands, and growing public use all contribute to the construction-related needs of New York’s public libraries. In order to fully understand and communicate these needs to policymakers and other stakeholders, up-to-date information must be collected and made available. Two assessments were conducted: (1) Estimated New York State Public Library Construction Needs 2012-2017 ($2.2 billion needed); and (2) Estimated New York State Public Library Construction Needs 2017-2020 ($1.7 billion needed). As of December 2015, Annual Report data showed that more than half of public library buildings in New York State are at least 60 years old, and 155 were built before 1900 (there are 756 public libraries in New York State and more than 1,000 buildings, including neighborhood branches). Twenty-two percent have at least one public area that is wheelchair inaccessible. New York State provided the following State Aid for Library Construction (capital funds) during the evaluation period: (1) $14 million via 170 projects in 2012-2013; (2) $14 million via 170 projects in 2013-2014; (3) $14 million via 182 projects in 2014-2015; and (4) $14 million via 173 projects in 2015-2016. State Aid has been increased to $19 million for 2016-2017, and the Board of Regents proposed an additional increase to $25 million for 2017-2018. The State Library is also tracking the public libraries going green in the state, with many of these libraries using State Aid for Library Construction and rebates through the New York State Energy Research and Development Authority to cover costs. Activity 2/Targets: Partner with national, state, regional, and local organizations to ensure that library staff, trustees, and patrons have ongoing access to high-quality digital literacy training programs. The State Library continued its strong partnership with NYLA, regularly participating in meetings, exhibiting, and presenting at its annual conferences, and providing information and assistance. The State Library collaborated with NYLA and the New York State Office for Cyber Security on a three-year, BTOP-funded project, titled Digital Literacy in New York . The Advisory Committee, started in 2011, was chaired by a Library Development Specialist from the State Library. Digital Literacy in New York aimed to: (1) create a basic digital literacy curriculum targeting patrons of New York State’s public libraries; and (2) train public librarians and staff in the use of the curriculum. A four-part curriculum package was developed, and is available on the project website. Per the project’s final report (2014), the website averaged 3,000 visits per month from more than 1,000 unique visitors. While the majority of access took place within the United States, international use occurred as well. Full-day, train-the-trainer workshops began in 2012, comprised of two three-hour sessions (one on how to teach the adult learner, and one on how to implement the digital literacy curriculum in various library situations). From 2012 to 2014, 50 workshops reached more than 1,000 participants from 58 counties and 393 libraries, covering urban, rural, and suburban areas (this is short of the target of training a minimum of 1,200 library staff). Training received positive evaluations from the vast majority of attendees (84 percent of participants said they would be likely or very likely to recommend the workshop to colleagues). Also, 85 percent of participants reported that they shared the digital literacy curriculum with colleagues, and at least 40 percent of those colleagues used the curriculum in their own instructional activities. Annual Reports indicated 156,405 digital literacy training sessions were conducted by libraries for 671,963 people from 2013 to 2015. A survey was not conducted to measure the following target: People using public libraries will benefit from expert staff trained in delivering digital literacy services as reported by a sample of users through qualitative surveys conducted annually from 2014 to 2016 at selected public libraries. Activity 3/Targets: Partner with library systems and others to ensure that all library staff and trustees are highly-skilled in using new technologies. As mentioned in the last activity, Digital Literacy in New York was successful in delivering a train-the-trainer program that brought technology training to libraries statewide. Many library systems and libraries partnered as hosts for the training. The chart to the right shows the extensive technology training offered by systems per Annual Reports. Continuing education in new technologies was also offered through expert-led WordPress, web accessibility, and social media sessions at ILEA and via WebJunction. Since 2014, 82 libraries in New York State have taken part in the Edge Initiative, a project led by the Urban Libraries Council and funded by the Bill and Melinda Gates Foundation. Edge is a management and leadership tool that provides libraries with valuable data—from operations, partnerships and programming, to assessing how a library's community is benefitting from library technology services. By completing the Edge Assessment, libraries will have access to rich data, four online training modules for library staff, customizable communications tools, and a comprehensive list of recommendations and resources. Also important to note, the Opinion Survey showed that 73 percent of respondents answered yes when asked if the State Library should provide training programs for staff in assisting patrons with technology, and 74-percent reported that they want support for the use of new technology. These were both in the top five for requested services. Activity 4/Targets: Support and encourage libraries to offer a broad range of community learning opportunities for all ages that support literacy, workforce development, civic engagement, and economic vitality. As mentioned throughout this report, the State Library offered multiple programs and services that fostered community learning opportunities that support literacy, workforce development, civic engagement, and economic vitality. New projects carried out during this evaluation period, such as Broadbandexpress@yourlibrary and Ready to Read at New York Libraries, as well as continued projects, such as Summer Reading at New York Libraries and State Aid funding programs for adult and family literacy and outreach, all worked to assist library systems and libraries in these areas. The Job and Career Information in New York’s Public Libraries webpage was also updated by State Library staff. Youth, adult, and all programming in general offered by public libraries increased from 2012 to 2015, as did attendance. See the graph above for all programming participation. Progress was made with the related Five-Year Plan target, the number of public libraries offering adult literacy and/or English as a second language (ESL) programs will increase by 25 percent by 2017. In 2012, 253 libraries carried out this programming, and in 2015, the figure rose to 294 libraries (up 16 percent). Activity 5/Targets: Expand partnerships among national, state, regional, and local organizations to increase participation in and awareness of Summer Reading at New York Libraries. In 2007, the State Library joined CSLP, a national consortium of 50 states, the District of Columbia, and two territories. The CSLP pools resources to create the annual national theme and many of the materials used for Summer Reading at New York Libraries and the separate New York State Summer Reading program site for kids, teen, parents, librarians, and educators . The State Library continued its partnership with the 23 public library systems by providing: (1) CSLP and other promotional materials, such as the teen Facebook page (1,073 likes) and teen video challenge; (2) programming idea resources, such as the CSLP manual and the New York State Performers and Programs database; (3) online registration tools, including Summer Reader and Wandoo Reader; and (4) funding assistance programs. For 2012-2013, the public library systems received Summer Reading Mini Grants (supported with LSTA funds). According to grant summaries, multiple partnerships resulted, with for example, Nassau Library System working with the Long Island Children’s Museum and local movie theatres, and the Suffolk Cooperative Library System partnering with St. Joseph’s College and Authors Unlimited. For 2013-2016, the Family Literacy Library Services Program theme was also summer reading, with a goal of increasing participation. Roughly 1,100 public library outlets used the Summer Reading at New York Libraries theme and materials. The State Library provided a CSLP manual to each public library annually, to foster the development of high-quality, customized summer reading programs in each community. The State Library offered manuals tailored for school libraries and for early childcare providers. Libraries partnered with local organizations and schools. Studies show that library summer reading programs raise children’s learning levels and help prevent learning losses during the summer. 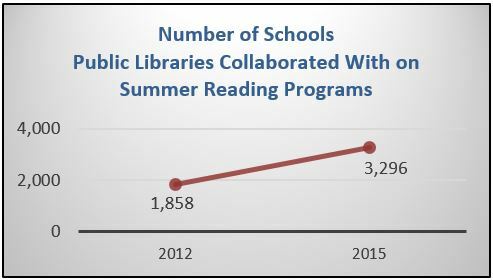 Annual Report data indicates collaboration has increased significantly to public libraries working with 3,296 or 53-percent of schools (public and nonpublic) on summer reading in 2015 (see graph), supporting progress toward the target of 80-percent of schools by 2017. 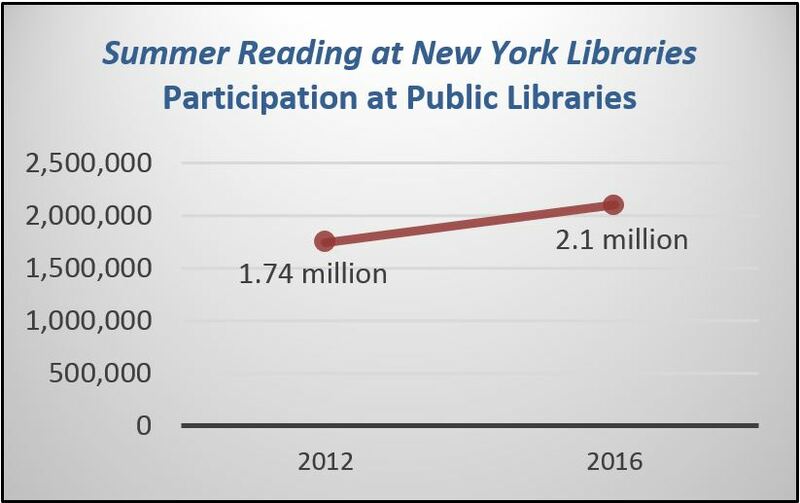 As a result of promotion and partnership efforts, Summer Reading at New York Libraries participation has continued to grow, with more than 2.1 million children and teens taking part in 2016 (up from 1.74 million in 2012). This figure greatly exceeds the target of 1.8 million by 2017. Also to note, the program received the highest very important score out of all statewide programs and services on the Opinion Survey (58 percent). Survey data from library staff and school leaders regarding some summer reading program targets in the Five-Year Plan was not available. Activity 6/Targets: Incorporate the use of library e-resources into summer reading program materials, activities and promotion. Summer Reading at New York Libraries materials did not include information about NOVELNY or other e-resources. Activity 7/Targets: Strengthen partnerships that enable public libraries to assist young families and child care providers in fostering early literacy skills for all children in New York State. Connect local libraries with statewide networks of childcare providers, non-profit organizations, public broadcasters, and others to enhance early childhood services, including parent education (see Goal 4). Partner with national, state, regional, and local organizations to increase family and caregiver participation in library-based early literacy programs that foster a literacy-rich home environment. As of January 2017, 90 workshops have been held, with a total attendance of 1,134 (from all 23 public library systems and 406 public library outlets or 37-percent of the program’s goal of reaching 1,100 outlets). This is the only data available to indicate progress towards the Five-Year Plan target of 75-percent of public libraries having staff skilled in the provision of early literacy by 2017. In 2012, 575 public libraries offered early literacy programming and in 2015, 621 libraries offered these programs (up by eight-percent, indicating progress toward the target of a 20-percent increase by 2017). Early literacy programs in public libraries also grew 13-percent to 110,099 sessions from 2012 to 2015, with attendance up an impressive 22-percent to 2.41 million people. Trainings will continue into 2019, with support from the 2016-2019 Family Literacy Library Services Program (the theme is Ready to Read at New York Libraries). An Advisory Group of early literacy leaders was also established, and worked effectively to make connections and further partnerships with many organizations, including: (1) the Council on Children and Families; (2) the Family Reading Partnership; (3) Infancy Leadership Circles; (4) LTA; (5) New York State Head Start; (6) the New York State Parenting Education Partnership; (7) NYLA and its Youth Services Section; (8) NYSED’s Office of Early Learning; (9) Public Broadcasting Stations; (10) the Public Library System Directors Organization, (11) QUALITYstarsNY; (12) Reach Out and Read; and (13) Read Aloud 15 Minutes. To note, QUALITYstarsNY was not funded as anticipated, and therefore the activity/target of QUALITYstarsNY childcare providers working with public libraries did not occur. For more information, see the program website. A Ready to Read at New York Libraries Facebook page can be viewed (390 likes and 384 followers as of January 2017), as can DayByDayNY, a fun and interactive early learning resource sponsored by the State Library for families, caregivers, library staff, and educators. A Spanish version of DayByDayNY is in development. Activity 8/Targets: Strengthen partnerships among the New York State Council for the Humanities, the State Library, library systems, libraries, and others to enable more public libraries to offer early literacy/family reading program in their communities. See the previous activity for Ready to Read at New York Libraries partnerships on early literacy. Activity 9/Targets: Strengthen partnerships among the State Library, the library systems, and local libraries to increase both awareness and use of the digital talking book program offered through The New York Public Library’s Andrew Heiskell Talking Book Library and the State Library’s Talking Book and Braille Library. New Yorkers are served by two regional Talking Book and Braille Libraries (TBBLs). These libraries are part of the national network that makes up the Library of Congress National Library Service for the Blind and Physically Handicapped. The State Library’s TBBL, one of the two, serves residents of the 55 upstate counties who are unable to use printed materials because of a visual or physical disability. While LSTA monies do not fund TBBL operations, they do support Division of Library Development staff time in promoting TBBL services, primarily through the State Library’s Coordinated Outreach Services Program. TBBL services and updates were consistently shared with libraries and the general public, through the State Library’s website, NYLINE (the State Library’s listserv), newsletters, presentations, and meetings, such as the Public Library System Outreach Coordinators Meeting. In 2015, an ILEAD team of State Library staff, worked on a TBBL promotion project titled Hear All About It, and presented it to the ILEAD cohort in New York. A new TBBL brochure ( ) was also developed. As for TBBL use statistics, there were 13,878 registered users and 2,515 registered institutions in 2016. Of the 13,878 users, 2,073 have active Braille and Audio Reading Download (BARD) accounts (or 15 percent). This is below the target of 33-percent using BARD. However, BARD use continued to rise during the evaluation period (as book circulation decreased). In 2011, there were 17,530 BARD downloads, and in 2016, there were 37,947 downloads. New technologies are predicted to make access easier especially for TBBL’s mostly elderly users, including a BARD Mobile App and a simpler BARD Express product for users without computer experience. Activity 10/Targets: Enhance local library programming through partnerships among libraries, library systems, historical records repositories, the State Library, State Archives, State Museum, and the Office of Public Broadcasting, and other national and state organizations that will provide libraries with timely, free access to New York State themed traveling exhibits, selected exhibit materials, and related online resources. The State Library has an Exhibits Committee, which focuses primarily on internal exhibits on the seventh floor of the Research Library, set up monthly or bi-monthly in the display cases for public viewing. [Current and past exhibits (back to 2011)] As an example, the December 2016 exhibit was the 75th Anniversary of Pearl Harbor. In addition to the on-site display, State Library staff posted an overview online featuring Pearl Harbor-related items from the collection (books, diaries, letters, photos, posters, etc.). Staff also continued to maintain the Online Exhibits at the Library webpage. As of January 2017, 15 exhibits were listed. In terms of traveling exhibits, there was one in late 2012, titled The First Step to Freedom. This exhibit featured the State Library’s copy of the Emancipation Proclamation, and was organized by the State Library, State Archives, State Museum, Board of Regents, and the Schomburg Center for Research in Black Culture of The New York Public Library. The exhibit traveled to nine different sites, mostly museums, across New York State. An informative website was developed for the project. The State Library also loaned individual items to other agencies or organizations, such as the State Museum and the New York State Governor’s Office, for inclusion in their public exhibits. As the State Library is not able to collect website use statistics at this time, online exhibit use is unknown. There is also no mechanism in place for capturing which libraries have used these resources. Therefore, the target of 30-percent of libraries using online or traveling exhibits by 2017 could not be measured. Activity 1/Targets: Increase the visibility of the statewide programs and services of the State Library available to New Yorkers. During the evaluation period, the State Library was very active in promoting statewide initiatives. The up-to-date State Library website (with its DayByDayNY, DHPSNY, NOVELNY, Performers and Programs, and Summer Reading at New York Libraries sub-sites) houses extensive information about a multitude of programs and services. NYLINE also continued to be an effective mechanism for providing updates and announcements to the library field. Messages sent via NYLINE reach roughly 3,000 users (library staff, trustees, volunteers, and anyone interested in library-related activities in New York State). Press releases were distributed to the media via NYSED to announce major initiatives or events, such as the availability of State Aid for Library Construction and the launch of Summer Reading at New York Libraries. Releases were used with other NYSED communication outlets, such as the Commissioner’s News and Notes (distributed to all New York State schools). Releases were also submitted to national library publications, COSLA, and other library-related listservs. Program brochures and fact sheets were regularly updated, and shared at presentations, meetings, exhibits, and displays with many audiences, such as library leaders, NYLA, LTA, the Board of Regents, the State Legislature, graduate schools of library and information science, and the general public. State Library exhibits took place at: (1) African American Heritage Day; (2) the Association of Law Libraries of Upstate New York Annual Meeting; (3) Great Places, Great Spaces (New York State Museum); (4) Health and Services Fair; (5) Legislative Disabilities Awareness Day; (6) the Library of Congress National Book Festival; (7) LTA Trustee Institute; (8) New York State Family History Conference; (9) NYLA Conference; (10) Researching New York Conference; (11) Staff Training Day at the Office of the State Comptroller; and (12) SUNY Albany Program Symposium. Brochures and other materials were continuously posted on the State Library website for easy download (for information about promotion specific to LSTA, see the next activity). Social media was also increasingly used. The State Library’s Facebook page had 1,342 likes and 1,316 followers as of January 2017, up from 201 likes in December 2011. Targeted Facebook pages for DHPSNY, NOVELNY, Ready to Read at New York Libraries, and Summer Reading at New York Libraries were updated regularly. The State Library also began an Instagram account. DHPSNY started Instagram, LinkedIn, and Twitter accounts. For Ready to Read at New York Libraries, a Pinterest account was put in place to showcase Early Learning Spaces in New York State libraries, as well as space planning ideas and inspiration from other sources. Activity 2/Targets: Regularly share information concerning the impact of LSTA federal funds with the library community and the general public. The State Library continued to develop a brochure each year outlining the importance and impact of the LSTA Program, titled LSTA Funds Help Insure that New Yorkers Have What It Takes to Compete and Succeed in Today’s Economy ( ). The brochure was widely distributed each spring with assistance from the Friends of the New York State Library, with policymakers, the library community, and the public as key audiences. Featured LSTA activities include NOVELNY and Summer Reading at New York Libraries. The State Library also maintained an LSTA webpage. Here, users can find the brochure just described, as well as the current Five-Year Plan, previous Five-Year Evaluation, and previous LSTA Grant Program descriptions. In addition, a list of congressional districts by library system or central/co-central library, and maps of every district with libraries marked have been included. The State Library posted LSTA-related news on NYLINE, and regularly included LSTA-related information in statewide meetings and programs, and at the exhibits mentioned under the last activity. The target of displaying information about LSTA supported activities at 25 meetings by 2017 was exceeded. Activity 3/Targets: Seek public and private partners in the implementation of the activities identified within this five-year plan. The State Library worked with a number of partners, both public and private, on multiple projects during the evaluation period, as mentioned throughout this report. In most cases, the agencies and organizations served in an advisory role for particular programs and/or assisted in carrying out specific program activities such as curriculum development, training, and/or promotion. The greatest example of new State Library partnerships is Ready to Read at New York Libraries with more than 13 partnerships developed since program inception. Activity 4/Targets: Use new communications technologies to provide leadership, technical assistance, advisory services, and professional development more effectively to libraries and library systems. The State Library used a variety of communication technologies during the evaluation period. Webinar software products, such as WebEx and Blackboard, were increasingly used to offer live State Library-sponsored or co-sponsored trainings on the following topics: (1) Common Core; (2) early literacy; (3) the Edge Initiative; (4) E-Rate; (5) the Impact Survey; (6) library construction; (7) new public library system director education; (8) New York State Health Benefit Exchange; (9) sustainable thinking for the future of libraries; (10) trustee education; and (11) workforce development. Vendor-conducted NOVELNY webinars were also offered (page 4). Many of the webinars were archived. In 2014, the State Library began its collaborative partnership with WebJunction, a program of OCLC Research with a mission to promote learning for all library staff by providing an open, online library community. The project provides free live webinars, online courses, and an abundance of archived professional development content for library staff, trustees, volunteers, and graduate students statewide. WebJunction is a State Library-approved provider of professional development hours required to maintain active New York State Public Librarian Certification. Use of WebJunction has already significantly increased, with course and webinar participation at 2,688 for July 2014 to June 2015, and up to 3,540 for July 2015 to June 2016. Additional products, such as BaseCamp, Doodle, SurveyMonkey, and WordPress, were used for program planning, implementation, and management, and data collection and evaluation. Communication with library system leaders was continued via regular NYLINE messages, monthly conference calls, and in-person meetings. Activity 5/Targets: Identify and facilitate opportunities for libraries, library systems, and the State Library to leverage additional public and private support that will improve library programs and services available to New Yorkers. The State Library leveraged outside support for multiple initiatives benefiting library programming and services statewide. For example, millions in federal grant funds were awarded for Broadbandexpress@yourlibrary, and the State Library received a modest IMLS Planning Grant for Ready to Read at New York Libraries. The State Library was a partner in two other federally grant-funded projects, Digital Literacy in New York and ILEAD. State Library staff provided E-Rate assistance, helping libraries obtain millions in federal funds for telecommunications). The LSTA sub-grants described in the next activity were also supported with in-kind funds provided by library systems, libraries, and partner organizations. Outside grant opportunities were routinely shared by the State Library via NYLINE. Courses and webinars in fundraising, marketing, and advocacy were also made freely available through WebJunction. Activity 6/Targets: Provide grants to library systems and libraries, as funds are available, to enable libraries to improve access, deliver innovative programs, and offer high-quality lifelong learning, literacy, and knowledge creation opportunities that enhance civic engagement and economic vitality. Adult Learners Belong in Libraries: The Mohawk Valley Library System partnered with two affiliates of Literacy New York to integrate library services with tutor training, improve communication among libraries and adult learners and their tutors, increase the overall number of tutors and the library sites where tutoring occurs, and improve library literacy collections. E-Mobile Training Lab: The Nioga Library System e-mobile unit visited satellite locations throughout Niagara, Orleans, and Genesee counties to provide vulnerable populations with access to the Internet, online job-related resources, and training in technology and job searching skills. Internet Safety and the 21st Century Learner: The Cayuga-Onondaga BOCES and Tompkins-Seneca-Tioga BOCES provided school librarians, teachers, and administrators with resources to support collaborative creation of an Internet safety curriculum with hands-on lessons and activities for students. Living Cities Summer Program: The New York Public Library partnered with Global Partners Junior to offer a seven week summer series of workshops for youth (ages 9-12) that aimed to increase participants’ cross-cultural skills, information literacy, and knowledge of global sustainability issues. Newspaper Digitization Project: The Northern New York Library Network digitized and added historical newspapers to the New York State Historic Newspapers site, where the public can easily access them for historical and genealogical research (see page 4 for more about this project). Activity 7/Targets: Revise NYSED policies, regulations, and program guidelines as needed to keep pace with change and to implement this five year plan. During the evaluation period, State Library policies and guidelines were updated on an annual basis to keep pace with new and changed requirements in State law and policies. In addition, State Library staff worked with library systems to identify potential changes to the Commissioner’s Regulations that would positively impact library services. Proposed changes for the construction program will be considered for approval by the Board of Regents during 2017. The expenditure policy for LSTA was also revised, as described in the previous activity. Activity 8/Targets: Continuously improve online planning, budgetary, and reporting tools for use by the State Library and by local libraries and systems. Bibliostat Collect and Connect, the State Library’s data collection and data sharing and comparison tool for library systems and libraries, was regularly improved during the evaluation period. The format of Library System Plans of Service was also reviewed and updated. Each of the 73 systems in New York State is required by law to submit a Five Year Plan of Service to the State Library via Bibliostat Collect, and it must be approved in order to receive State funds. During 2013-2014, State Library staff worked on a new framework for 2016-2021 Plans, shared proposed formats and instructions, and obtained feedback from library system staff and other stakeholders. In December 2014, the new framework was approved and released, and the subsequent Bibliostat Connect upgrade was complete in April 2015. Annual Report frameworks for the three system types were also reviewed and significantly revised. The State Library worked with NYSED Information Technology staff to transition processes using paper and Microsoft Office to streamlined, online systems. For example, librarians can now apply for/renew their New York State Public Librarian Certificate via an online portal. Using Oracle, several web-based products were developed as well, including State funding applications and fiscal reporting tools submitted by library systems and libraries. State Library staff can quickly create complex fiscal projections of State Aid allocations, track State Aid payment information, and put together other reports, such as those required by IMLS for LSTA. The Oracle products have reduced redundancy. They significantly increased task efficiency for all users, and improved State Library customer service. Activity 9/Targets: Participate in national, state, and regional partnerships that promote collaborative collection development, access to resource sharing, and sustaining information in all formats. First joined in 2008, the State Library has continued its membership in the Information Delivery Services (IDS) Project . The IDS Project is a mutually supportive, resource sharing cooperative within New York State whose members include public and private academic libraries, The New York Public Library, and the New York State Library. The Project is based on a strong sense of community among its members and a unified collection perspective. The major goal of the Project is to continually implement and objectively evaluate innovative resource-sharing strategies, policies, and procedures that will optimize mutual access to the information resources of all IDS Project libraries (from http://www.idsproject.org/index.aspx). The program has grown to include 103 members as of January 2017, and provides professional development, best practices, and support. State Library staff took part in various IDS Project trainings during the evaluation period, and attended regional and statewide meetings. As the State Library is only participating in the IDS Project, the Five-Year Plan target of participating in at least three resource sharing projects by 2017 was not achieved. Technical difficulties prevented participation in additional collaborative projects, such as ConnectNY and SUNYConnect. Integrated library system (ILS) platforms were not compatible. To note, SUNY and private college and university libraries do participate in the IDS Project. Activity 10/Targets: Build capacity to enhance early childhood outcomes by partnering with statewide early childhood networks including (but not limited to) the NYS Early Childhood Advisory Council; the Early Care and Learning Council and its network of childcare resource and referral agencies; United Way of NYS and its local United Ways; public television stations; and early childhood teacher preparation programs. As mentioned, the State Library partnered with a number of organizations to bring early literacy services to communities statewide via Ready to Read at New York Libraries. Through this collaborative work and staff training, the target of facilitating community partnerships was achieved. One curriculum component focuses specifically on building partnerships and conducting outreach, and participants learn how to develop an Early Literacy Partnership and Outreach Plan. Public libraries reporting local collaborations on early literacy increased from 399 in 2012 to 437 in 2015 or 10-percent (indicating progress towards the target of 20-percent by 2017). Activity 11/Targets: Partner with the State Archives, the State Museum, the Office of Public Broadcasting and Educational Television, and others to provide seamless access for New Yorkers to the holdings of State Education Department research collections. The State Library worked with other NYSED agencies on joint exhibits featuring collections. Activity 12/Targets: Expand use of State Library resources onsite, through email, and through ILL by providing timely access to requested copies of materials and information from State Library collections. ILL decreases resulted from the transfer of the State Library Prisoner Service Project to another state agency. In 2013, a Prisoner Services Project Task Force was established to review the current project procedures, identify ways of reducing service costs, improve speed and quality of service, and determine the availability of alternative service delivery options. The program had provided materials directly to inmates in New York State correctional facilities since the 1970s. Task Force findings led to the decision to transfer responsibility for the program to the Department of Corrections and Community Supervision in June 2014. The ILL requests are now received through regular processes, and staff members previously assigned to this project were moved to assist with related technical services. Also to note, the Opinion Survey showed that respondents gave ILL the highest very important score in the Research Library services category (by almost 20 points, with New York State digital collections coming in second with 47 percent, and TBBL at 44 percent). Activity 13/Targets: Expand online services for interlibrary loans by investigating State Library partnerships with existing resource sharing platforms similar to the IDS Project (such as ConnectNY and SUNYConnect). See page 21 for information about the IDS Project, ConnectNY, and SUNYConnect. Activity 14/Targets: Partner with national, state, and local organizations to improve statewide access to full-text electronic federal and New York State government documents. The State Library’s Digital Collections web based repository, Archivalware, continued to grow during the evaluation period. The web-based platform, now with enhanced search capabilities, has improved access to the State Library’s digital New York State Government and digital Manuscripts and Special Collections documents. Since 2012, more than 19,000 items were added to the repository, which now contains more than 65,000 documents and images. Purls for all documents in the repository were added to the State Library’s online catalog ensuring permanent access, and copies of all repository documents were included in a dark archive for preservation. Staff also continued to work on enhancing metadata for existing records to improve the search experience of users. Due to security and technical infrastructure challenges, the self-publishing aspect of the repository was not realized. The State Library continued to seek the cooperation of state agencies in establishing more efficient methods of capturing born digital documents. An electronic mailbox was maintained for agencies to send digital documents directly to the State Library. A few agencies (the Department of Environmental Conservation, Department of Transportation, and the Division of Military and Naval Affairs) also provided scans of older documents for inclusion in the repository. Activity 15/Targets: Expand access to information provided by the State Library both onsite and through the library’s website, including information about State Library collections and statewide programs and services. The State Library has expanded access since 2012. The target of providing metadata for three hidden collections was exceeded. The following three collections were catalogued (with five other collections partially completed): (1) the Dr. J. A. Schiltkamp Collection (400 plus items); (2) International Military Tribunal for the Far East Records, 1946-1948 (22 boxes of records); and (3) the Jean Ritchie Collection (400 plus items). Manuscripts and Special Collections catalogued 1,423 items and developed 152 finding aids for FY 2013-2015 (greatly exceeding the target of 25 finding aids each year). However, the target of 30 new or revised webpages to Research Library collections annually was not met, with only 33 new pages/sections developed from October 2012 to September 2016, and one collection page and an online exhibit (15 pages) significantly revised. Staff shortages and one very large project, a collection guide of World War I posters completed in 2016 (to be posted in 2017), were the reasons more pages were not developed. Finding Aids | Collections More than 130 presentations and trainings for the general public and staff on a variety of topics were offered in FY 2013-2015. Also, the Research Library’s work in providing on-site and online exhibits for public use was detailed previously. Data to measure the following target was not available: By 2017, 40-percent of people responding to web-based or onsite surveys will report benefiting from information obtained from State Library collections or services. Activity 16/Targets: Promote user self-service or non-intermediated access to State Library collections using enabling technologies. Enabling technologies noted in the previous Five-Year Evaluation, such as the ability for users to make ILL requests online through ILLiad independently, continued. The ILL request form and other forms The RSS feed also continued, but use statistics are not available. Social media was increasingly used to promote and feature collections, with an Instagram account added as previously mentioned (page 18). BARD use also increased. Activity 17/Targets: Participate with the NYSED Office of Educational Design and Technology in the implementation of the University of the State of New York (USNY) Statewide Learning Technology Plan. During the evaluation period, NYSED focused on other priorities, so the State Library did not take part in the implementation of the USNY Statewide Learning Technology Plan. Activity 18/Targets: Work with public and private entities to ensure that New York’s libraries obtain and sustain robust, high-speed broadband connections through increased use of partnerships, E-rate telecommunications discounts, and other mechanisms. As described earlier, Broadbandexpress@yourlibrary, E-Rate, and State Aid for Library Construction all supported bringing robust, high-speed broadband connections to libraries. The State Library also participated in the New York State Broadband Summit. Enhancing broadband continues to be a major priority, as indicated in the Opinion Survey. Broadband initiatives received the second highest very important score for statewide programs and services (at 56 percent, two points below Summer Reading at New York Libraries). Also, 82 percent of respondents answered yes when asked if increased bandwidth (broadband) for libraries should be an area where the State Library offers support going forward. This was the top program/service desired. Annual Report data further supports broadband needs as illustrated in the graph above. 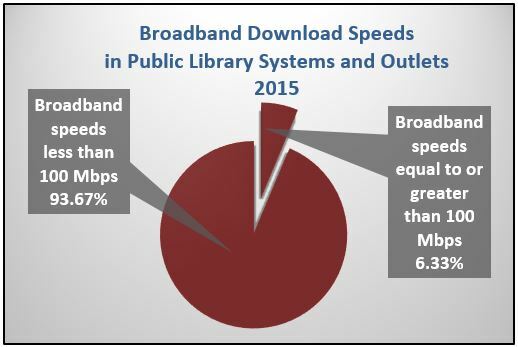 The vast majority of public library systems and outlets reported broadband download speeds of less than 100 Mbps in 2015. Question A-2: To what extent did your Five-Year Plan activities achieve results that address national priorities associated with the Measuring Success focal areas and their corresponding intents? For the purposes of this question, a substantial focus would represent at least 10-percent of the total amount of resources committed by the overall plan across multiple years. For those who answer yes to any of the above groups, please discuss to what extent each group was reached. None of the above groups represented a substantial focus of the State Library’s Five-Year Plan. B-1. How have you used data from the old and new SPR and elsewhere to guide activities included in the Five-Year Plan? SPR data was shared with the evaluator for the Five-Year Evaluation. In many cases, it was helpful in determining if target outputs and outcomes were achieved, and where additional progress was needed. These findings will help to inform the new Five-Year Plan. B-2. Specify any changes you made to the Five-Year Plan, and why this occurred. There were no official Five-Year Plan changes submitted to IMLS. B-3. How and with whom have you shared data from the old and new SPR and from other evaluation resources? SPR access was given to the evaluator for the purpose of carrying out the Five-Year Evaluation. C-1. Identify how you implemented an independent Five-Year Evaluation using the criteria described in the section of this guidance document called Selection of Evaluators. The State Library selected an independent evaluator, Amanda R. Latreille of AmaLat Consulting LLC, in mid-2016. Mrs. Latreille is a librarian and Certified OBE Trainer, with more than a decade of relevant experience. She has trained hundreds of library staff members in applying OBE methods. She wrote the State Library’s 2007-2012 Five-Year Evaluation, and has conducted several other evaluation projects. Also important to note, Mrs. Latreille was hired by the State Library as a vendor to carry out a few activities of the Five-Year Plan, such as conducting evaluation trainings for the OBE Initiative, Broadbandexpress@yourlibrary project, and ILEAD. C-2. Describe the types of statistical and qualitative methods (including administrative records) used in conducting the Five-Year Evaluation. Assess their validity and reliability. Reports, data, and other relevant documents from the last five years were provided by State Library staff for review by the evaluator beginning in September 2016. These documents may have been developed by the State Library, library systems and libraries, partnering organizations, consultants, and/or vendors. Access to the SPR was also supplied. The evaluator interviewed multiple State Library staff members from the Division of Library Development and the Research Library. Questions regarding Five-Year Plan activities, including any successes, challenges, and unexpected findings, were asked and answered. The evaluator found no reason to believe there were any issues with the validity and reliability of the information provided. Two surveys were developed by the evaluator, with input from staff: (1) the Opinion Survey, which collected feedback from the library field regarding the value of State Library services; and (2) the Library System Survey, which collected information about system activities at the regional and local levels. The Opinion Survey, sent out via NYLINE, received 847 responses, and the System Survey received 49 (out of 73 total systems or 67 percent). Significant results of these surveys were included throughout this report. Lastly, OBE and the State Library’s OBE Initiative were strengths of the evaluation (page 8). The logic model approach was used with many of the State Library programs analyzed, and with the Five-Year Evaluation. The Five-Year Plan was written with target outputs and outcomes that were each addressed in this report. C-3. Describe the stakeholders involved in the various stages of the Five-Year Evaluation and how you engaged them. State Library staff, as mentioned earlier, were interviewed by the evaluator. The library field was invited to take part in the Opinion Survey, and library system leaders were asked to respond to the Library System Survey. The final Five-Year Evaluation Summary was reviewed and discussed by the LSTA Committee of RAC. The final Evaluation Report was reviewed by the State Librarian and selected State Library staff. C-4. Discuss how you will share the key findings and recommendations with others. The State Library will use this report as a starting point for developing the new Five-Year Plan. Stakeholders, such as IMLS, RAC, State Library staff members, library systems, and policymakers, will be able to review and use the report. Other state library agencies may find the evaluation findings helpful if planning to develop similar programs or services. The report will be posted on the State Library’s LSTA webpage, and will be shared with New York’s library field via NYLINE and nationally via COSLA communications. In terms of findings, the graph below illustrates the number of responses for each of the 2020 Vision and Plan recommendation themes (for complete theme descriptions, see http://www.nysl.nysed.gov/libdev/future/index.html). In other words, system directors were asked to provide examples of programs or services that the system was offering in any of the theme areas. Per survey results, work was completed during the evaluation period in all areas, with advocacy/marketing, access (e-access/digitization), and collaboration showing the most activity. The biggest challenge in carrying out the Plan of Service activities is the lack of adequate funding which is stressing the system staff and limiting services we could offer. Like most library systems, [our library system] faces ongoing funding challenges. Over the past decade, city funding for public libraries has been cut by nearly 20-percent and library staff levels have been reduced by over 1,000 workers. While the city made major investments in libraries over the past two years; libraries still don’t have the resources they need to keep up with the demand for books, programs, and services. Many branches still need critical upgrades and repairs. The loss of LSTA funds for regional projects continues to be problematic; those funds were historically awarded to library systems for innovative projects. Money is always a factor. As a school library system we are continually trying to meet the needs of all learners, and we do an incredibly good job on what is provided by the state but we could always use more funds. We have a deep seated concern that Opposing Viewpoints will disappear from NOVELNY each year. The loss of LSTA grants severely restricted our ability to experiment with new concepts as it occurred at the same time when State funds were reduced. Even the loss of Documentary Heritage Program funds required the diversion of funds to sustain some of the archival programs that our members expected since we had provided these programs for some 25 years.